As we close the first quarter I want to provide a bit of perspective and accounting from a macro and a trading perspective. As I view them very much separately first a view of the macro and then some thoughts on the impacts on trading strategies and tactics. It is a game of confidence after all, a game that relies on people keeping allocating cash into the stock market the only place where yield can still be found. A game of confidence that relies on the belief that someone else will always show up to buy stocks, a game of confidence that the Fed will never let stocks sink again, a game of confidence that the Fed will always be there, ever capable of preventing anything bad from happening. Remember though: The Fed doesn’t produce anything, it aims to influence economic stability, growth and job creation through its policies. Since the financial crisis it has done so by repeatedly throwing money at the problem. The ONLY reason they are still doing this of course is because the policies are not producing the desired results. 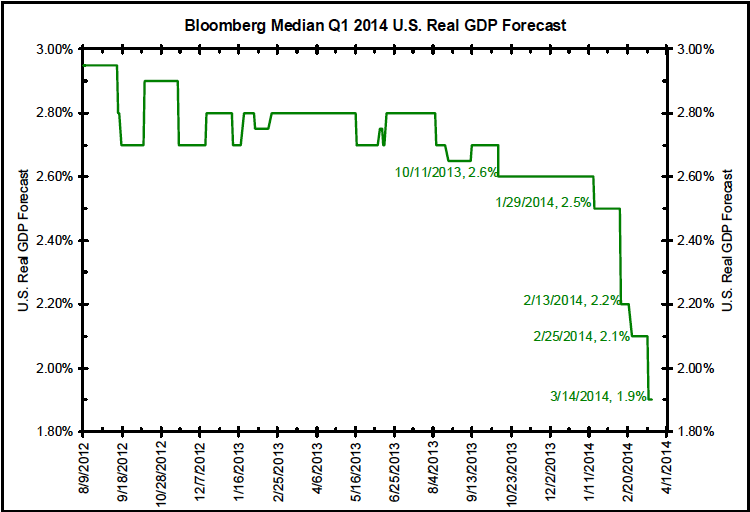 And so they keep at it as tapering does not mean removal. 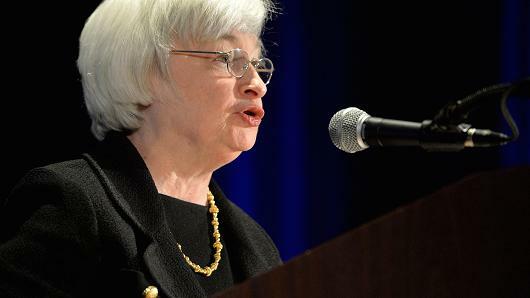 Billions of dollars of liquidity continue to be injected into the system on a daily basis. And they are not the only ones of course: The Europeans, Japanese and Chinese continue to be in permanent easing mode as well. I’d be all for it if it produced tangible results, yet what I see is nothing but a sea of debt that is producing diminishing returns all the while increasing systemic risk that can ultimately exacerbate the consequences of such policies. As long as the game of confidence works I supposed the appearance can be kept up for a while yet I continue to see cracks emerging. In my mind the confidence game is hanging by a thread that is at risk of being cut at anytime as macro data shows a deteriorating fundamental picture and could produce a sudden reversal in confidence in the Fed as the savior of ever green flowing stock market returns. 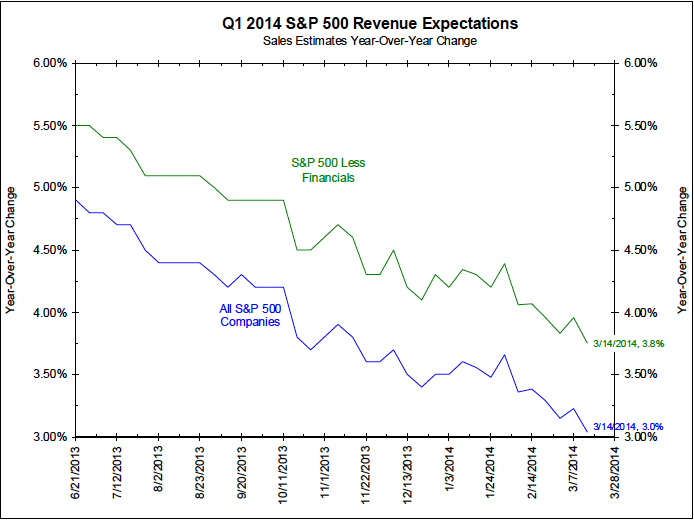 So it’s no surprise that company revenue estimates are coming down, but note that this trend started way before there was bad weather. 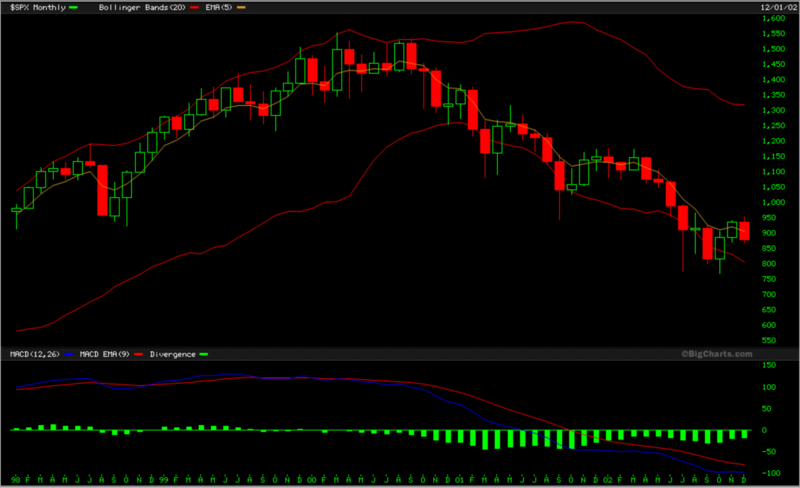 The trend is your friend is a common phrase I keep hearing when looking at charts. Well what’s the trend here? 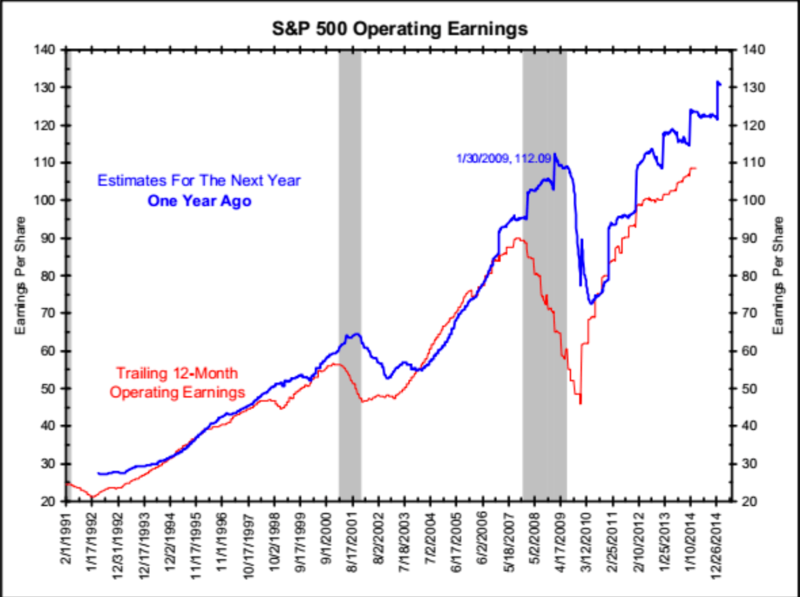 So little surprise then that negative EPS guidance is ballooning. For Q1 we have seen the 2nd highest number of $SPX companies issuing negative EPS guidance since 2006. 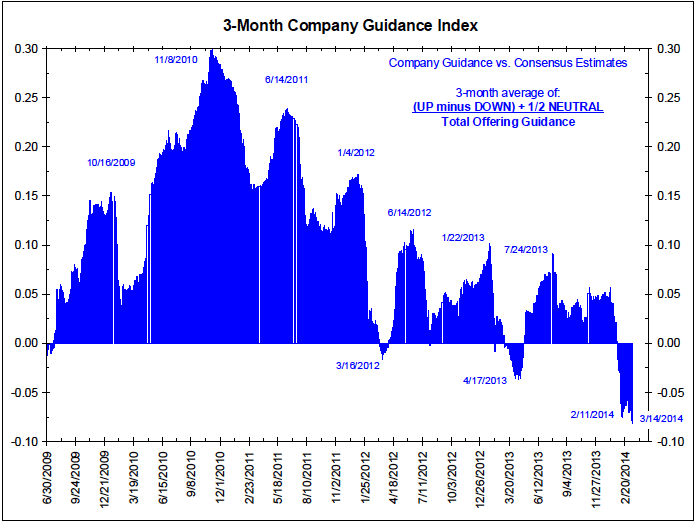 In fact 93 companies have issued negative guidance versus 18 positive. Not an encouraging picture. Notice a trend? 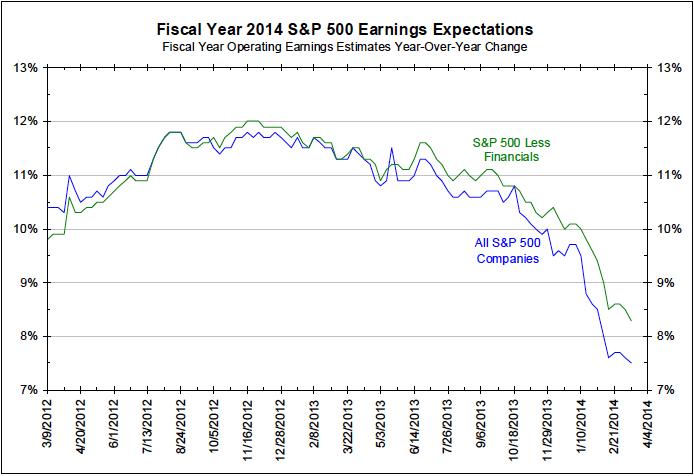 Yet, Wall Street, in the continuing hunt for money inflows hasn’t changed their EPS estimates for the year. Bottom line: There is a very large disconnect between the what is projected and what is happening. While the 1st quarter results on the indexes seem to indicate a relatively mundane basing of prices longer term charts highlight the increasing risk investors face in light of the deteriorating macro back drop. While the current sea of liquidity seems to preclude any sharp corrections investors should heed the lessons of history: Trends can revers suddenly and harshly. 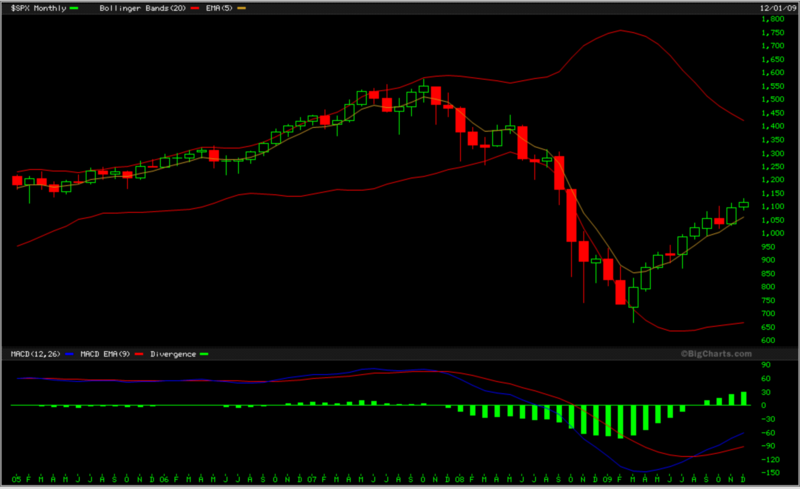 In 2000 for example the NDX dropped 25% in just 8 days while all looked all trendy just days before. 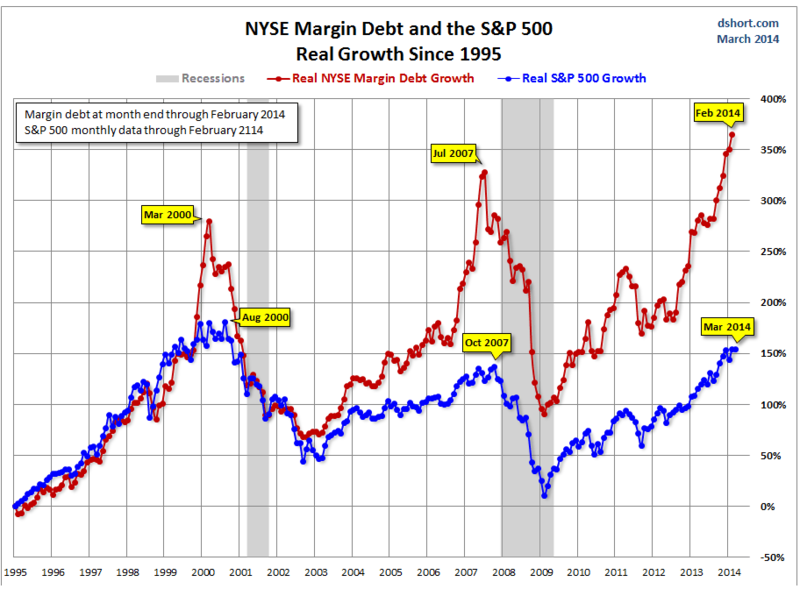 Let’s look at some longer term charts to see how things stack up in terms of risk. 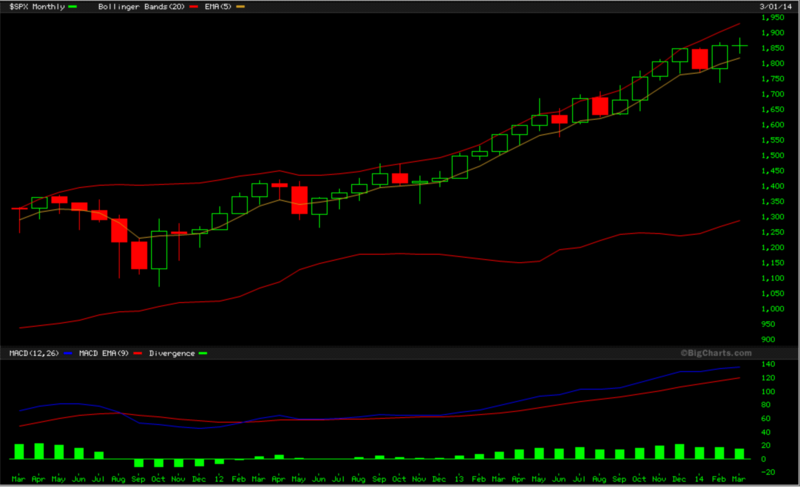 I’m a big fan of monthly and quarterly charts. Not because they help me in my daily trading (they don’t), but I use them as a general map helping me identify where we are in the journey that is this market. Basically the implication for me is that the first steep move lower will likely by a nice buying opportunity for a renewed push toward or even exceeding highs before a fundamental re-connect with reality will occur. Which brings me to the trading aspect of it all. Chances are if you just held positions in the first quarter of 2014 returns were somewhat flat, yet from a trading perspective markets were fabulous if you were able to catch the right direction, probably disastrous if you didn’t. It’s always easy to look at a chart which shows the past and state: “Well if i had sold here, and if I had bought here I would’ve or could’ve….”. Trading does not work that way. Trading is hard and reading the tea leaves is not easy nor is making the proper entry/exit decisions even if you can identify a good risk/reward set-up. As is well known by now traders are swimming in markets that are filled with HFT sharks and algo programs hunting their stops. Maybe the FBI may have something to say about it. No matter, as a trader you have to adjust and trade the market that is. And this is what I try to do every day with utmost flexibility and I’m extremely pleased to say that the first quarter has been extremely successful by being flexible, tactical and opportunistic in the trades I choose to pursue. While not perfect (I’m not an HFT algo) my analysis has kept me largely on the right side of the market in either direction and my process has helped me produce some overly positive trade entries and exits. I had offered a total of 203 trades in the first quarter, 55% of which were options trades with the remainder futures trades. Some were intra-day trades with immediate results, some were trades that took longer to set-up and required patience to come to fruition. But the net win ratio was one I hope to be able to repeat going forward: 100% win rate on futures trades and 80% win ratio on options trades. I publish at least on a weekly basis the concluded trade set-ups I offer in real-time in the private feed. I do this to offer transparency as to what I produce for clients who see my trade entries and exits live in the private feed. As I look back on the quarter I note 3 key factors of what has worked well and what hasn’t. On the positive side of the ledger: Clearly the process I have been using. I find it well balanced, analytical and well suited to identifying good set-ups. Where I see room for improvement: I do best with intra-day option trades. Holding options overnight or over several days leaves much more room for decay risk. And it is in these option trades where I have realized almost all losing trade-set ups. Hence I prefer trading futures for overnight positions as it removes the decay risk equation. One final factor of self critique: I keep under estimating the ferocity of the up moves this market makes. Hence I seem to leave money on the table or scaling in a bit early for short positions requiring more patience in the hold of positions. It is a tricky balance frankly to manage as I am a strong believer in discipline and process. What this market via Fed induced shenanigans keeps telling participants over and over: Ignore all risk and go in 100% all the time and you will make the most money. I can’t help but be taken aback by this message and I am truly concerned how much this theme will hurt over-margined investors at one point. So while I take this point as a trading lesson I’m also very weary of playing this game in light of all the factors I highlighted above. Right now what I’m doing is working and is working well. Why mess with a good thing? Best wishes for a successful 2nd quarter!